Who hates cleaning make up brushes? I know I do, as it’s such a tedious task. With the amount of make up brushes I use daily for work and filming tutorials. It feels like a part-time job just cleaning them. That’s where the Palmat comes in to save the day. Now don’t get me wrong as a avid make up brush collector, I thoroughly enjoy looking at beautiful clean make up brushes. I just don’t like cleaning them myself. 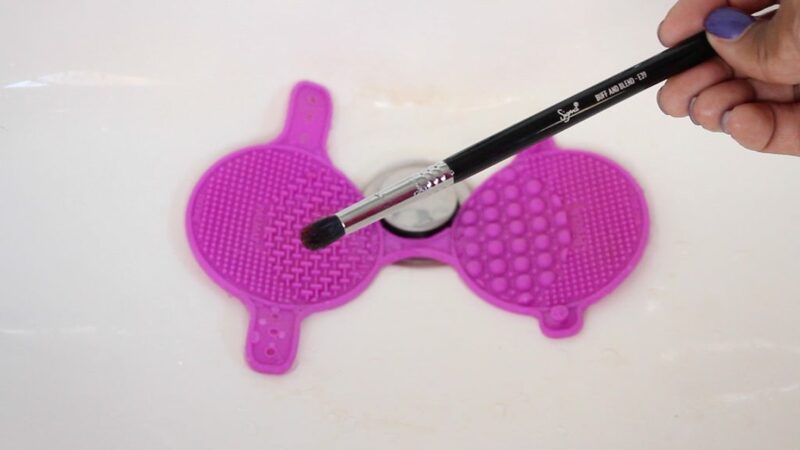 So when I had a chance to review the new make up brush mat by Palmat it was right on time. I also took this opportunity to enlist the services of my five year old daughter. Mommy can always use a extra set of hands since she loves to be mommy’s little helper. The Palmat is a 2 in 1 brush cleaning tool that helps to deep clean your make up brushes. Made out of silicone the Palmat has adjustable straps to fit around your hand as well as suction cups to adhere to your sink for hands-free cleaning. The Palmat is great for travel and fits perfectly in any makeup bag or even a makeup kit for traveling artist as well as makeup enthusiast alike. There are other brush clean the mats on the market. However, one great thing I like about this brush cleaning mat is that you are able to hold it in your hand. With the suction cups on the bottom of the mat it also fits perfectly in the sink or any flat surface. The price is also a major selling point at only $9.95. I have personally seen and own other make up brush mats that retail for over $50. This mat works the same way for a fraction of the cost. Surprisingly, the Palmat also has a two year warranty. Can’t beat that! I have a mini demo on how I use the Palmat with my Sigma make up brushes and Sigma makeup Liquid brush cleaner. For more information on products used I will have the links below as well as any discount or promotional codes if available. Discount Code: CHIMERENICOLE at checkout for 10% off any purchase.